Welcome! This library research guide provides an introduction to library resources related to finding data and statistics, using both the library's resources as well as those available online. In simple terms, data is essentially raw information, resulting from a study, survey, or other method. This includes information from datasets, data tables, machine-readable data files, and data files from software programs. Below is an example of a dataset. 1. The branch of mathematics that deals with the collection, organization, analysis, and interpretation of numerical data. Statistics is especially useful in drawing general conclusions about a set of data from a sample of it. 2. 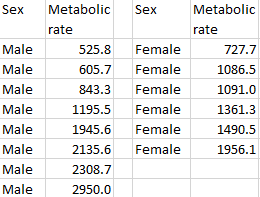 Numerical data used in drawing general conclusions from a sample of it. In other words, statistics are the results of analyzing raw data, and are helpful in interpreting and understanding it. Statistics are often presented in tables, charts, or graphs, but may also be reported in books and articles. Below is an example of a statistical table. "data." The American Heritage Student Science Dictionary, edited by Editors of the American Heritage Dictionaries, Houghton Mifflin, 2nd edition, 2014. Credo Reference, http://sc4.idm.oclc.org/login?qurl=https://search.credoreference.com/content/entry/hmsciencedict/data/0?institutionId=5065. Accessed 24 Jul. 2018. "File:Furness data table.png." Wikimedia Commons, the free media repository. 23 Jul 2017, 17:42 UTC. 24 Jul 2018, 13:22 <https://commons.wikimedia.org/w/index.php?title=File:Furness_data_table.png&oldid=252799006>. "statistics." The American Heritage Student Science Dictionary, edited by Editors of the American Heritage Dictionaries, Houghton Mifflin, 2nd edition, 2014. Credo Reference, http://sc4.idm.oclc.org/login?qurl=https://search.credoreference.com/content/entry/hmsciencedict/statistics/0?institutionId=5065. Accessed 24 Jul. 2018. "File:Arrests timeline by drug.png." Wikimedia Commons, the free media repository. 26 Apr 2018, 04:58 UTC. 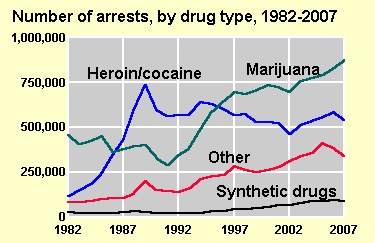 24 Jul 2018, 13:37 <https://commons.wikimedia.org/w/index.php?title=File:Arrests_timeline_by_drug.png&oldid=298572243>.